The SMARTSACK has been designed to fit chairs up to 43cm wide. There is an expandable fold at the side of the chair to allow it to fit the larger sizes whilst it will sit well without sliding on the smallest sizes. In the unlikely event of a problem with the fit, the SMARTSACKS can be returned for a full refund. The manufacturer of our product also makes golf bags for companies with a worldwide reputation – and the same material is used for both. The material is water resistant and extremely robust. 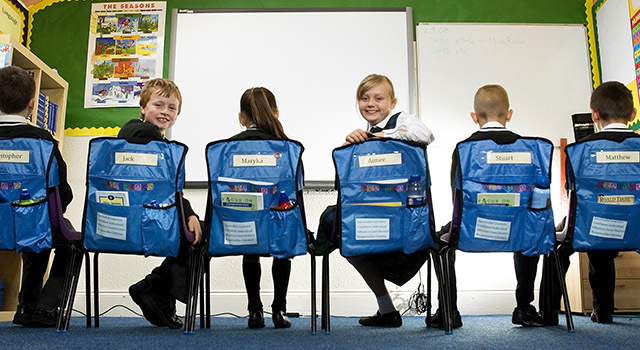 At the present time, the SMARTSACK is only availiable in a vibrant peacock blue colour which was the most popular choice amongst all our tester schools. The SMARTSACK logo is embroidered in several bright colours. Can I personalise my SMARTSACKS™ ? Absolutely! There are two clear pockets on the front of the SMARTSACK. One is ideal for a pupils’ name or the name of the school. The other is larger and can be used for duty tags such as ‘group leader’ or reward tags such as ‘star pupil’. Are the SMARTSACKS™ comfortable to sit on outdoors? Our tester schools say that they are. There is good quality padding in the back of the SMARTSACK™ which means they can be used on grass or harder surfaces. Ten SMARTSACKS™ is the minimum order. This allows us to keep our costs competitive. The more you buy, the more cost effective they are.